'That's chickenfeed for the functionaries who cram my e-mail inbox every day with such a constant flow of job offers that trying to empty it is like trying to drink dry the horn connected to the ocean in Norse mythology,' says Sunanda K Datta-Ray. Saffron patriots know Rahul Gandhi is wrong. No Gujarati has been unemployed since October 7, 2001, and no one elsewhere in the country since May 26, 2014. Those dates are as portentous as August 15, 1947, and January 26, 1950. The exodus from Gujarat is downright fake news. The thousands of men and women queueing with bundles and bedding rolls are holiday makers, seeking a festive break during Dussehra. Mr Gandhi's Facebook post is also wrong in blaming 'poor' economic policies, demonetisation and a 'poorly-implemented' GST for factories closing down and throwing men and women out of jobs. There were no factories to close. As for GST, a realtor tells me he has replaced his corporate stationery with bills and letterhead flaunting only his name. Individuals are exempt, he says. Mamata Banerjee's promised bonanza to 28,000 Durga Pujas may have lured some holidaymakers from Gujarat to Kolkata, but Varanasi remains the favourite destination. Its odour of sanctity recalls the Bharat that flowed with milk and honey before Indians were allowed to plunder the country and escape abroad. Every other Bharatiya was a genetic scientist then deftly plonking animal heads on tubby human bodies. Stem cell technology was a cottage industry. Interplanetary flights soared from the sacred banks of an unpolluted Ganga after Rama piloted the first aeroplane. Internet messages whizzed across Kurukshetra's battlefield. Aryabhata laid the foundations of nuclear science. As the country's most important parliamentary constituency, contemporary Varanasi is also India's political hub. After all, religion is the only basis of nationalist politics. Other politicos are Urban Naxalites waiting to be surgically struck. Varanasi, and not Ghaziabad, is where Adityanath's institute for budding politicians should be sited. Yes, politicians need thick skins, as Indira Gandhi advised K Natwar Singh. But really successful operators must also cultivate nimble fingers, sleight of hand, forked tongues, double dealing, turning black into white, minority-lynching and Dalit-bashing. Sartorial lessons should include draping saffron robes, tonsures, designer stubble, fancy turbans and tucking handkerchiefs into waistcoat pockets. Future netas must not examine Gandhi's statues for monograms. He wears a loin cloth, not waistcoats. Congress fears of free training for RSS cadres are groundless for they already know the tricks of the trade. Narendra Modi, who took Shinzo Abe to Varanasi, might send other foreign leaders there to see the latest Indian magic of turning the unemployable into leaders. The enterprising young Sachin Pilot once calculated that with a million Indians flooding the labour market every month, only an additional 12 million jobs annually could keep unemployment at the same level. That's chickenfeed for the functionaries who cram my e-mail inbox -- and millions of others no doubt -- every day with such a constant flow of job offers that trying to empty it is like trying to drink dry the horn connected to the ocean in Norse mythology. There are jobs in the police and universities, in hospitals and banks, for graduates and constables. The Bank of Baroda seeks a manager. Scientific advisers, lower division clerks and 'Bharti constables' are as much in demand as engineers and IT professionals. Uttarakhand wants lecturers, Sikkim needs sipahis, Assam wants policemen, Chhattisgarh is crying out for 'officers'. Uttar Pradesh, Madhya Pradesh and Hindustan Petroleum seek personnel. We are reminded that 'Jawaharlal Nehru University hires candidates for various posts'. There are no ads for politicians. They might feature in 'situations wanted' columns once Adityanath's institute gets going. We'll need more states then for ministerial appointments. The commonest words in these hundreds of notices are 'sarkari' and 'naukri'. The former proclaims a ma-baap regime's effective benevolence. The latter advises simple folk that naukri means a meal ticket. Many advertisements dispense with details altogether to announce just 'sarkari naukri'. For large swathes of the population, that spells security and status. It is what the fathers of marriageable girls traditionally look for in sons-in-laws. The Chinese called it the 'iron ricebowl', the ricebowl that never broke or cracked. 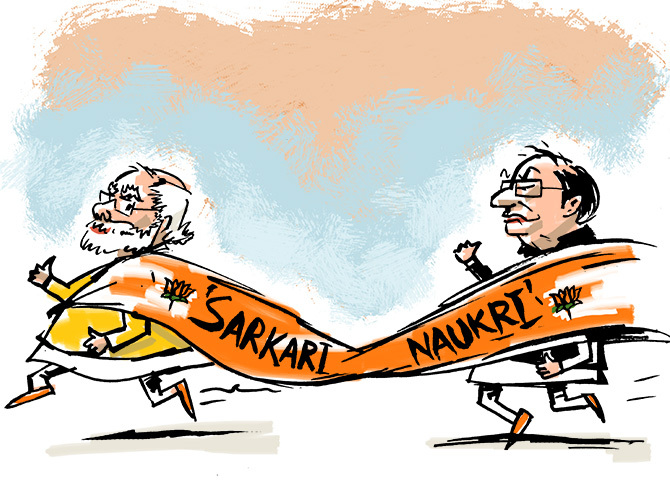 With the 2019 Lok Sabha election approaching, the real message is more profound. It's a reminder of who provides the iron ricebowl. Of course, more often than not, the bowl is empty. But how are netas to know that? They are familiar with only gold and silver ricebowls overflowing with pulao or mithai. Is India's job market as bad as it is made out to be? Is Yogi scared of the Mughals?